At Jason J. Augustine D.D.S., M.S., P.C., we want you to have the healthiest mouth possible, which means we work to diagnose and treat gum disease before it progresses. Early diagnosis and treatment are crucial for the successful treatment of gum disease. In the early stages of gum disease, the initial focus is on basic oral care and non-surgical periodontal therapy which will increase the chances of keeping your teeth. We offer a procedure called scaling and root planning (deep cleaning) to help treat the infection before it becomes much more severe. Scaling and root planning is a non-surgical periodontal therapy that the hygienists will perform. 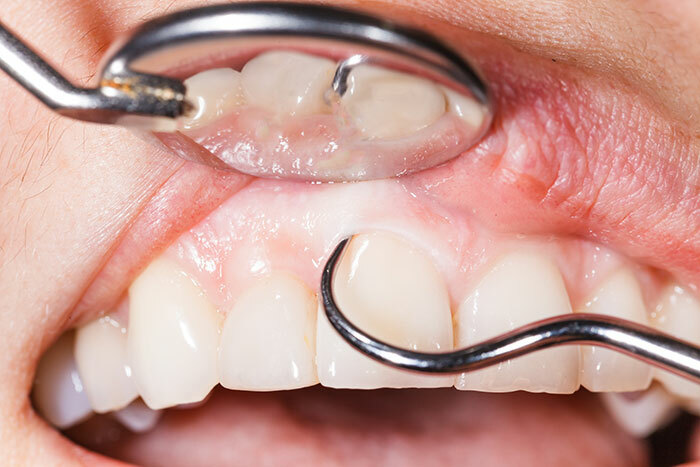 During this deep cleaning procedure, the areas are numbed and the dental plaque and the infectious bacterial calculus is removed. The infected roots of the teeth are cleaned and smoothing or planing of these surfaces is performed. This thoroughly removes toxins and microorganisms that cause the destructive inflammation/infection. During this phase of care, it is common to use antiseptic rinses and various forms of antibiotics to help. If you notice that your gums are red, swollen, bleeding, or painful, contact our office for an appointment and we will diagnose your condition and recommend this or other levels of care. Regularly scheduled recall maintenance cleaning visits with a hygienist at Jason J. Augustine D.D.S., M.S., P.C. can help many patients with advancing gum disease. This video shows you how excessive calculus and bacterial deposits are removed from beneath the gumline to stop the spread of periodontitis. This video shows you how excessive calculus and bacterial deposits are removed from beneath the gumline to stop the spread of gingivitis.